Most of us constantly carry on an internal dialogue. While talking to ourselves, we tend to miss the moment to moment awareness of life. Practicing meditation (zazen) brings us back into the moment, where our lives take place. The breath is central to this moment. In sitting meditation the body, breath and heart-mind are brought together in one reality. The most effective body position for zazen has been the pyramid structure of the seated Buddha. Sitting on the floor is recommended because it is very stable. We use a zafu (a pillow) to raise the behind so the knees can touch the ground. With your bottom on the zafu and your knees on the ground, you form a tripod base that is very stable. There are several different leg positions that are possible. You should choose the one best suited to you depending on the legs and body structure. The postures are full lotus, half lotus or cross-legged. Some use a small wooden bench while others use a chair. When using a chair, sit in a natural upright posture with feet on the floor. It is best to not lean on the back of the chair. The ideal posture is neither too rigid, nor too relaxed. The spine is kept straight in a 90-degree angle to the floor. The head is held so that the nose is in a straight line with the navel and hara (tanden), which is the physical and spiritual center of the body two inches straight down from the navel. The chin is tucked in slightly and the ears are in line with the shoulders. The arms are held slightly loose at the side, as if one were holding an egg underneath each armpit – not loose enough to drop them, but not tight enough to break them. The hands are held below the navel, in front of the hara. The rear hara is always pressed towards the front hara to prevent bending of the spine. The hands are held with the left hand on the right palm and the thumbs joined together in a circle. This is a mudra – a symbolic gesture, which symbolizes the universe. The eyes are half open, neither staring intently (which causes headache), nor completely shut (which can lead to daydreaming and drowsiness). The angle of vision is approximately 15 degrees in front of you, towards the floor. Do not focus on anything in particular. Keep the mouth closed so that all breathing takes place through the nose. The teeth join naturally as a result of the chin being held in. The tongue is held against the roof of the mouth to prevent saliva from filling up the mouth. It’s just your natural breathing. Do not try to control your breathing. The breath is used as a way to focus, to concentrate the mind. In other words, we bring the two things – the breathing and the mind together. We begin our practice by counting the breath. Count each exhalation. Begin counting up to the number ten and then begin again. Do not force your breath or try to control it. The only agreement you make with yourself in this process is that if your mind begins to wander or if you become aware that you are chasing thoughts, you will look at the thought, acknowledge it and consciously let it go and start counting again at one. The counting is feedback, letting you know when your mind has drifted. You are not trying to stop thinking, you are allowing thoughts to rise and fall away naturally. As you relax into what is, the mind will naturally settle down. Whether you can count to ten or not is not important. Just be present to what is happening. Watching the Breath. If your wandering thoughts are minimal, and you can maintain the count without losing it, you can drop counting and just observe your breath going in and out. Keep your intention at the tip of your nose. If, without any conscious effort, your breathing naturally descends to the lower abdomen, allow your attention to follow your breathing there. Do not try to control the tempo of your breathing: just watch and follow it naturally. A less strenuous method, also conducive to a peaceful mind, is to just keep your attention on the breath going in and out of your nostrils. Again, ignore wandering thoughts. When you become aware that you have been interrupted by thoughts, just return to the method. A third method of focusing the mind is to focus the attention on the Hara, which is a point located below the navel. The hara is not an organ, but a center of psychic energy similar to the Indian chakras. This method is best employed when your breathing has naturally descended to the abdomen. The technique consists simply of mentally following the movements of the dan tian as the abdomen moves in and out as a natural consequence of breathing. This method is more energetic than the methods of breath counting or following, and should be used only after gaining some proficiency in those methods. In any case, the method should not be forced. In practicing meditation, it is important that body and mind be relaxed. If one is physically or mentally tense, trying to meditate can be counter-productive. Sometimes certain feelings or phenomena arise while meditating. If you are relaxed, whatever symptoms arise are usually good. It can be pain, soreness, itchiness, warmth or coolness, these can all be beneficial. 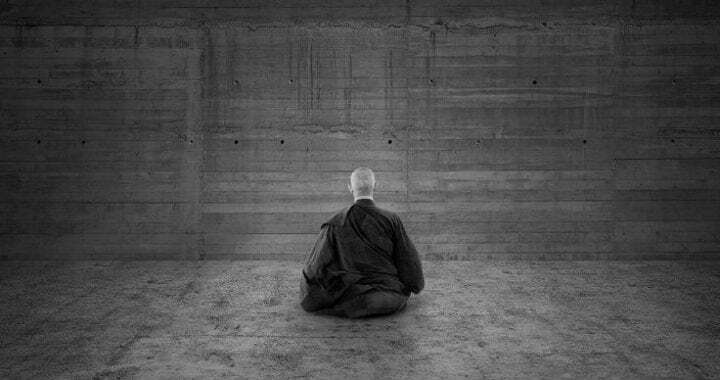 It is said that 20 to 30 minutes sitting zazen is ideal. However, even 5 minutes will help you focus and get some clarity into your life. Start where you are. Try to practice every day. You will discover that everything you do is part of your practice. Standing, sitting, walking, laying down, everything is your practice. It is life changing. In slow walking, the upper body should be in the same posture as in sitting, the difference being in the position of the hands. The left palm should lightly enclose the right hand, which is a loosely formed fist. The hands should be held in front of, but not touching, the abdomen. The forearms should be parallel to the ground. The attention should be on the bottom of the feet as you walk very slowly, the steps being short, about the length of one’s foot. If walking in an enclosed space, walk in a clockwise direction. You are developing the power of concentration, focus, and clarity. As our practice deepens, insight naturally develops into our true nature, which is free from distractions, vexations and delusion. Developing insight, we see the world as it actually is, interconnected and free, without being clouded by our own self-referenced likes and dislikes, judgments and assumptions. We see through our emotional and psychological baggage, experience, and knowledge. From a Zen perspective, things exist interdependently, apart from our labels, likes and dislikes. Everything is unfixed, interdependent, and inseparable.